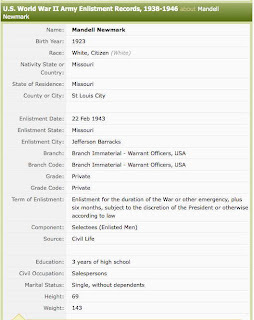 If you copied the transcriptions of WWII enlistment records from Ancestry.com in the past, it might be prudent to do a search and see if the "Civil Occupation" has been changed. Depending upon when you made the copy, there is a very good chance that it has. I don't know yet the date the records were updated/corrected. 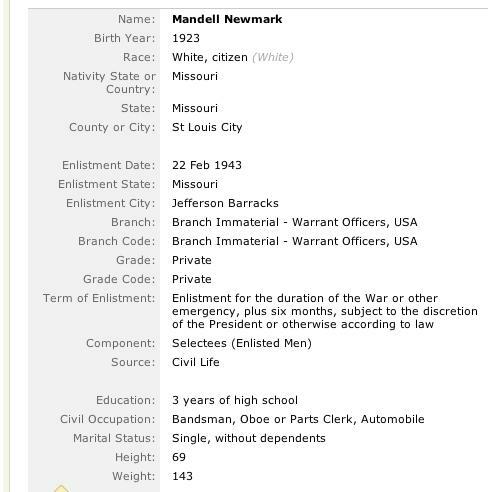 As I mentioned in my post earlier today, I noticed that Ancestry's WW2 Enlistment record for my Great Uncle, Mandell Newmark, had changed since I copied it in 2007. 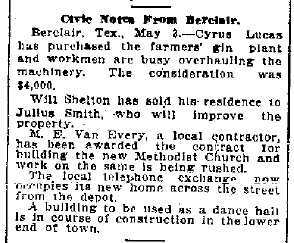 The Civil Occupation had been changed from "Bandsman, Oboe or Parts Clerk, Automobile" to "Salespersons." It was my belief that the original transcriber of the record had misread the Occupation Code. That is no longer my belief. 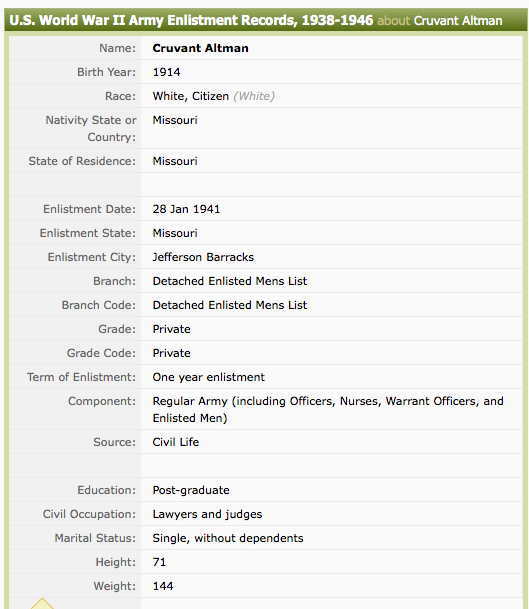 The Civil Occupations on other Enlistment Records I screen-grabbed back in 2007 are now different too. 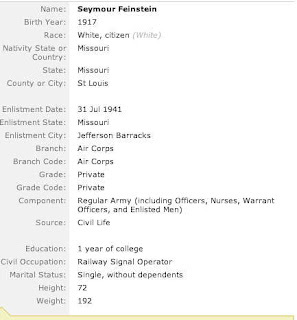 Formerly "Bandsman, Oboe or Parts Clerk, Automobile"
It seems that the Occupation Code List has changed as well. The two lists are significantly different. Comparing the old and new descriptions to the old and new Occupation Code lists reveals that in none of the cases above did the occupation code change. The transcription error was not in reading the code. The transcription error was apparently using the wrong list. Meaning this wasn't an error in one or two records. The error would have been in ALL of them. 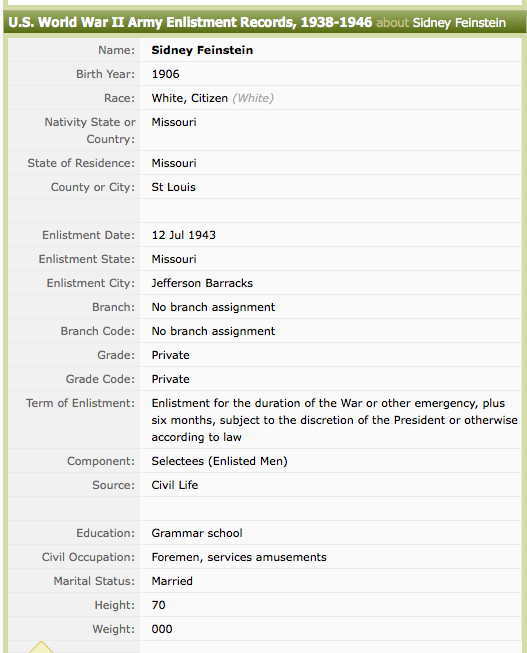 Did Ancestry.com or the National Archives ever make an announcement that they had erred, and that those who had looked up records before should look again? It's very possible they did and I missed it. Maybe others did too. I've decided to participate in this meme, as the occupations of my ancestors are of interest to me. 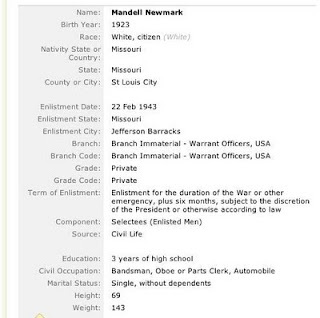 This week I am looking at the high school occupation of my paternal great uncle, Mandell Newmark (1923-1945). 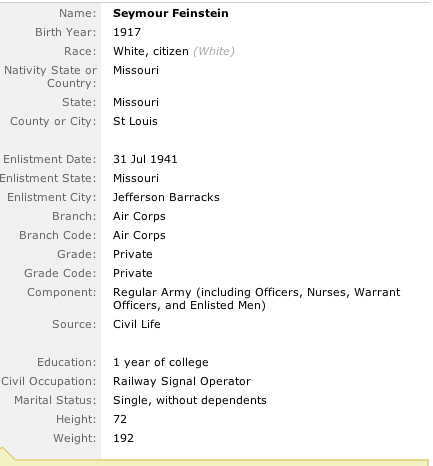 He was killed in action during WW2. 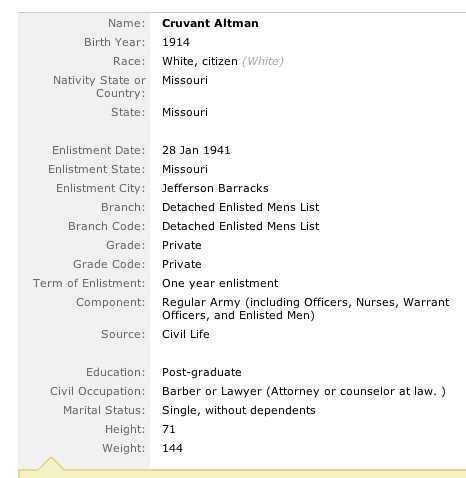 Back in April of 2007, I found on Ancestry.com a transcription of his enlistment record. This is what it looked like. The civil occupation confused the heck out of my family. 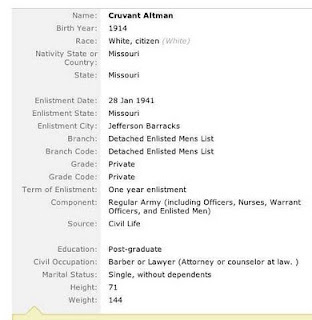 We knew his occupation before the war, as a high school student, was a sales clerk at a department store. No one remembered him playing the oboe, or working as an Automobile parts clerk. 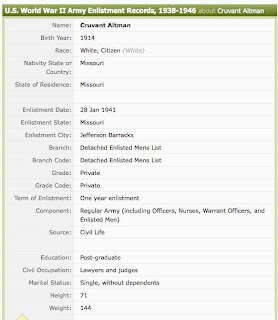 I found a listing of Civil Occupation Codes used on the enlistment records, and realized that "Bandsman, Oboe or Parts Clerk, Automobile" was code 175 and "Engineering Aide (Designated Field) or Sales Clerk" was code 170. 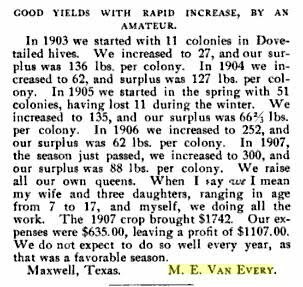 I figured that whoever transcribed the record misread a handwritten 170 as a 175. That's the problem with transcribed records - you don't see what the transcriber saw, so you can't judge its accuracy. Curiously - At some point in the past 4 years, Ancestry's record was changed. This is how it reads now. Not only did someone figure out the code had been misread - they somehow knew Mandell was a salesperson, and not an Engineering Aide. Without seeing the actual document, I don't know how. I'm glad the record has been updated. However, I would have liked to have been notified that the record had changed. 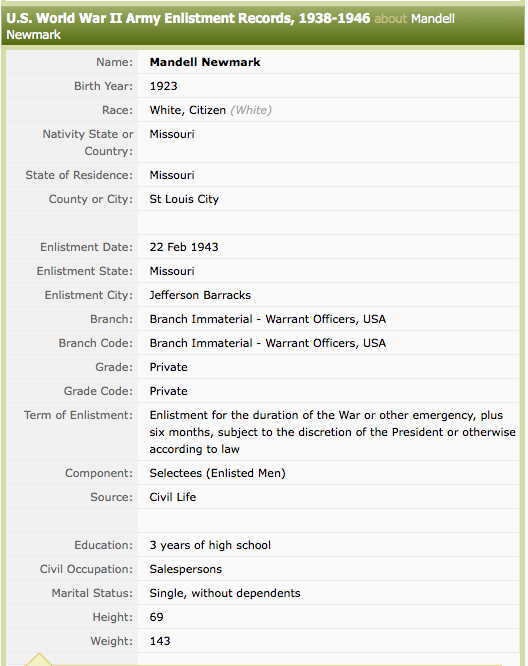 I did attach the record to my great uncle's entry in my online family tree, so Ancestry had a way to know that I was interested in the record. Of course, technically, the current transcription is no more reliable than the first. I happen to have reason to believe it is currently correct -- in the Civil Occupation field, as well as several others. However, seeing a transcribed record is never the same as seeing an image of the original. Update: I have just discovered a list of Occupation Codes on the National Archives site which varies significantly from the list linked to above. It doesn't have the weird combinations of occupations being assigned to the same code. I'm unsure of the difference between the two lists. 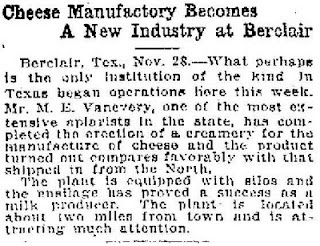 This week, I look at an article that appeared in the March 19, 1915 edition of the St. Louis Jewish Voice. 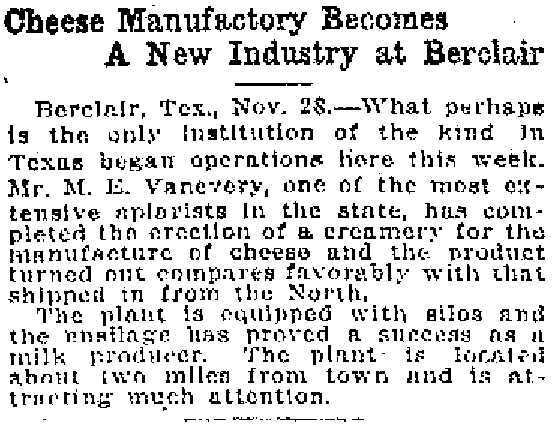 It is a reprint of an article that appeared the prior week in The St. Louis Republic. The article provides both an history of the congregation up to that point, and a description of the then-current synagogue. My grandmother, Belle (Feinstein) Newmark was born in 1914, and grew up in the congregation. She remembered moving in the 1920s to the location on Skinker Blvd which now houses the Missouri History Museum Library and Research Center. That's the location I grew up in, and I remember the move in the 1980s to the current location. No. 6. Pocket Computer, 4 inches in diameter, with Time, Calendar, and Compass cards. Michael Hait at Planting the Seeds discusses the 5 Most Misused Words in genealogy. The reaction to this has all been positive. There has been a lot of reaction to this change, much of it negative. Back when Ancestry acquired Footnote (11 months ago) - I drew the comparison to Coke acquiring Pepsi. In the comments, I said "There might be some renaming of products, but the products could remain the same." The renaming has begun. I may be wearing a tinfoil hat, but I don't think the closeness to 1 year is a coincidence. They assure us the non-military documents will all remain on Footnote. But I won't be surprised if a year from now a migration of non-military records from Footnote to Ancestry begins. And perhaps a migration of military records from Ancestry to Footnote. (Even though, today, they are saying that isn't happening.) They have a business reason to encourage people to continue to purchase both subscriptions. Geni made several changes to their website, requiring a subscription to do a lot that was previously free. Some have hypothesized that a jump in usage at WikiTree may be related. Geni made a few tweaks, hoping to appease the concerns. For his weekly Saturday Night Genealogy Fun Randy at GeneaMusings suggested we seek help from the Online IChing. Go to IChingOnline.net and ask a question relating to your genealogy research. You can "throw the coins virtually" or "throw the coins by hand." You have to click the "throw" button six times, then click on "Read." I threw the coins virtually. Report the question you asked and the answer you received, in the form of the Cast Hexagram (which explains the situation you are now in, or what has gone before), to your readers. Where will I find the record of my great grandmother Bertha's birth? It is wise to seek audience with him there. Making an offering will seal your good fortune. A goal will be realized now. Does the answer make any sense to you? How do you interpret the answer? This makes some semblance of sense. 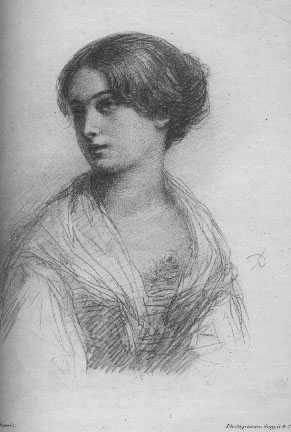 Bertha (Cruvant) Newmark referred to her father as Moshe Leyb the King. It was a joke likely based at least in part on his initials (M-L-K) spelling the Hebrew word for King. Is the I Ching telling me I need to figure out the synagogue my great great grandfather attended, and if it still exists, perhaps they might have some records? What kind of offering do I need to make? The Center of Convergence I should seek might refer to the local genealogical society. Others are certainly drawn there. I've been a member previously, but I have let my membership lapse. The word, "reviewing" literally means "seeing again." 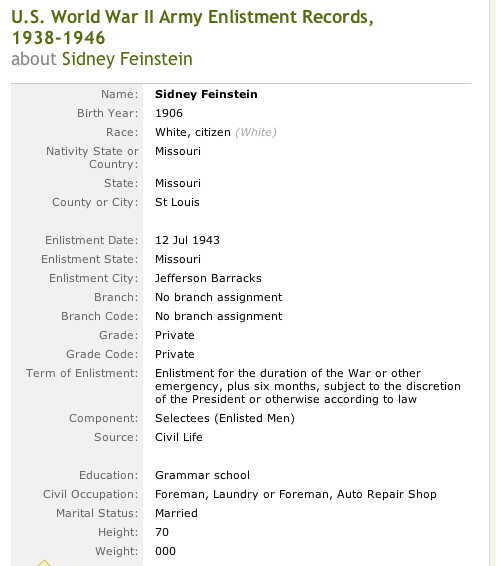 A while back I contacted the local Moolah Shrine Temple for any information they had on my Great Grandfather, Herman Feinstein's membership. 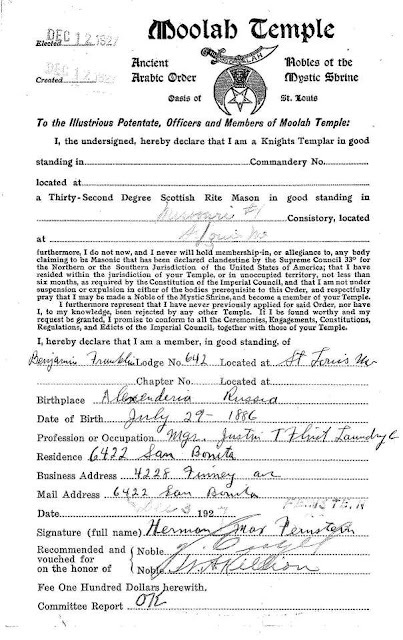 (The Moolah Temple is a masonic organization) They sent me the application he filled out in 1927. 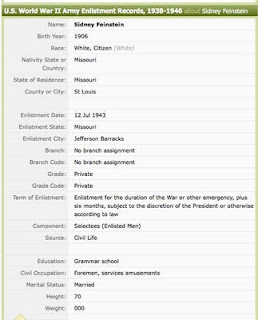 One piece of information on the document stood out: his birthplace. This was the first document I found which narrowed down the origin of this branch of the family to anything smaller than "Russia." Neither Herman's Social Security Application, nor his father's naturalization document, had been more specific than that. 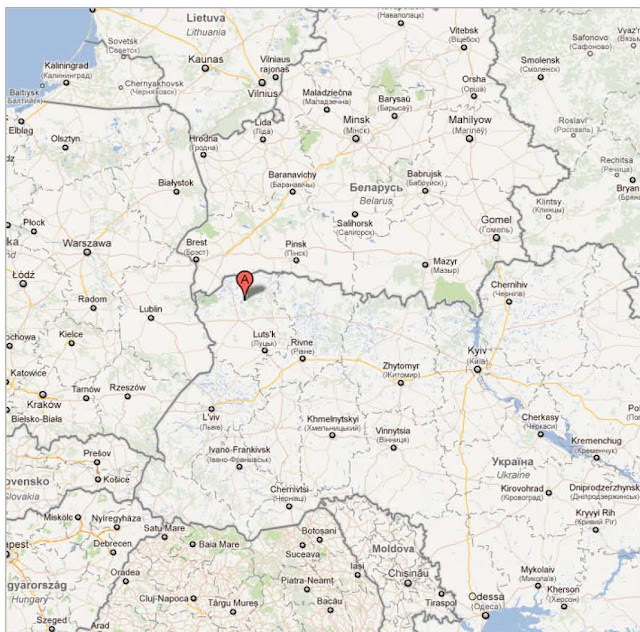 However, a search for shtetls with names close to Alexandria in the Russian Empire at JewishGen yielded nine. And I had some cause to be suspicious, since my limited understanding of Masonic organizations suggest they incorporate Egyptian symbolism, so my great grandfather could have creatively selected a town in Russia with an Egyptian counterpart. The document was sent to me via email, and I downloaded it to a documents folder when I received it; I even emailed a cousin interested in the origin of Herman's mother's family about the contents, but I forgot completely about it. I was on Ancestry this week searching on the name of Herman's father - Selig Dudelsack. (Selig changed the family surname to Feinstein.) And I viewed again the Hamburg Passenger Manifest. There, in the column "Bisheriger Wohnort" (Former Residence) it said "Wolinsky, Russland." How did I miss that? The document is in German, and I suspect I focused mainly on the information I could readily read, like the names, and date. I had the English arrival manifest from Castle Garden. So I went into my email to contact my cousin with this information, and searched for the last email I sent him. And I rediscovered the document above. One of the 9 Alexandrias is in the Volhynia district, aka Wolyn, aka Wolinskie. I don't know if they're related, but some of the names match names in my tree, which raises the odds. (Though some names are common enough, perhaps not by much.) "Shmuel" (Samuel) matches the name of Selig's father. And on the passenger manifest, the name for Herman's brother who was known as "Ben" in America, looks a lot like "Berl." I thought it was sloppy handwriting, but 'Berel/Beryl' as a Hebrew name isn't completely unheard of. I like this idea. I, too, have been surprised by both the unique, and often repeated occupations of my ancestors. Most of what I have learned about recent ancestors hasn't been 'news' to my family, though I have uncovered documentation, and some extra details. 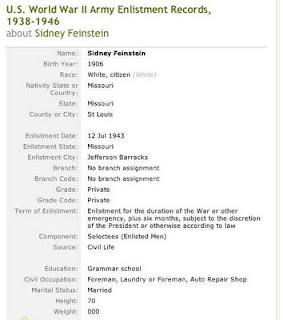 Perhaps the biggest revelation has been in the case of my second great grandfather, Selig Feinstein. 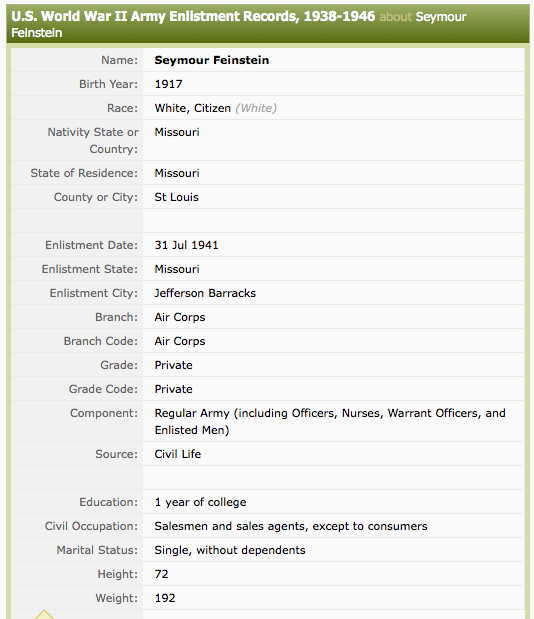 The paternal grandfather of my paternal grandmother, Selig arrived in America in 1890. The family remembered him as being active in both real estate and in the laundry business. My interpretation of these facts is that following the successful patent of improvements to fire hydrants, shoers Feinstein and Wieselman promoted themselves to blacksmiths and experienced enough success that Feinstein opened his own junk store. Then, at the age of 46, Selig left the junk store business. Selig seems to have entered the Real Estate and Laundry industries just as his children were starting out in these industries themselves. This leads to questions concerning his role in these ventures. His participation may have been a means of passing on his business management experience to his children. This week, I look at the Declaration of Intent for Charles Cohen (1884-1965). He married Bella Newmark, who was the sister of my great grandfather, Barney. The below XKCD comic has led me (and others) to consider Password Security the past week. The webcartoonist defends his math here, though it should be noted, very few are arguing the underlying message. Not everyone realizes this, but it is recommended that your password be different on every website. That way, if a website is hacked and your password there is discovered, it's not easy for the hackers to sign in to your other accounts. This is why some suggest The Only Secure Password is the One You Can't Remember. Using software such as LastPass, KeePass, or 1Password, you can let the software remember all but one of your passwords. Each time you log into an account, the sofware will ask you for the master password, and then enter that particular website's password for you. This seems to be a great solution, if you have one computer. All your passwords are stored encrypted on that one machine. I occasionally house-sit for members of my family, and I may log into one of my accounts from their computers. When I'm at the library I may log on to one of their computers, because while I could use one of my mobile devices, I like the larger screen. I have been known to check my email on my friend's computers, though those days may be behind me now with the mobile devices. Some suggest a workaround for some of the above is Dropbox, LiveMesh, SpiderOak, SugarSync, or Wuala. (The link compares the software for each.) Each of these allow you to sync files across multiple computers. However, the most popular of these, Dropbox, recently had a security issue. The most secure of these five programs are SpiderOak and Wuala, because they allow you to encrypt your data locally before sending it to their website. "Your data encryption key is only saved on your computer." Unfortunately, for me, neither SpiderOak nor Wuala works on a BlackBerry. And, of course, none of these help you with computers that aren't synched -- those at the home of a family member, a friend, or at the library. Is it safe to write down all your passwords on a piece of paper? I'm not an expert, but I think it depends upon who you think you are hiding the information from, and how it is written down. I could record the passwords for all of the sites I listed above. I wouldn't put my name on it. I wouldn't include my usernames. If the piece of paper was left behind on the seat of a taxi, or at the library, and someone picked it up, what good would it do them? Even if a fellow genealogist picked it up, and figured out the code, without knowing whose it was it wouldn't be useful. If your spouse, or kid picked it up -- yes, they could figure it out. So if you have an issue of trust with someone in your household, this might not be a solution. Use one of the Password Management systems for any website you are willing to limit your use to one computer (or more if you are willing to trust the synching software.) For the handful of websites you feel you need to be able to access on other computers, you can write those down on a piece of paper. For example, I know the only websites that I access from my Blackberry are my email, and social networking accounts. So I could set up a LastPass, KeePass, or 1Password account using Wuala or SpiderSync for everything else, and still feel pretty secure. So,whether you are creating one master password to control all your other passwords, or you are creating multiple passwords you will write down on a piece of paper, we are back to asking which passwords are the most secure. Not from your spouse or kid who might be able to guess that your password is G3n34l0gy! But from a computer hacker who knows nothing about you. Because unless you are somebody important, no one is going to be trying to hack your accounts specifically. You're only at risk if your password is one of the 'low hanging fruit' passwords the hackers find before they're satisfied. Randall Munroe, webcartoonist for XKCD, isn't the first to suggest that Multi-Word Phrases are More Secure than Incomprehensible Gibberish. Once the hacker has to resort to "brute strength" - that is, trying every possible combination of letters, numbers, and symbols - the length of the password matters more than anything else. Even if the characters are a series of periods, dashes, or spaces. How Big is Your Haystack helps you compute the strength of a password. Michael John Neill at RootDig reminds us, despite what Ancestry's shaky leaf suggestions might say, the SSDI Last Residence is not always the Place of Death. Susan Farrell Bankhead at Susan's Genealogy Blog is trying to help the LA Fire Department track down some photographs of fallen firefighters. James Tanner at Genealogy's Star discusses the Ethics of Photo Restoration or Editing. Should we use Photoshop to add someone to a photo, take someone away, or clear up teenage blemishes? His post reminded me of something I wrote in 1987 for a college newspaper, and I blogged about back in 2003. I suspect in 10 years, or earlier, we may be having similar questions concerning video editing. Joanna Geary, focusing on the privacy and social media issues, describes how she tracked down an entire family starting with one twitter post. Some using the Blogger platform may be interested in Google Scribe, which suggests words and phrases as you type. Discover Magazine's Not Exactly Rocket Science blog looks at hair-thin electronic skin, that can monitor hearts, the brain, and control video games. io9 also discusses the breakthrough. Jasia at CreativeGene has published the 108th Carnival of Genealogy - the theme was Food. The theme for the 109th edition will be Our Ancestors' Place of Worship - deadline September 1st. Denise Levenick at The Family Curator shares five tips for creating the perfect Dear Photograph picture. Kathryn Doyle at CaliforniaAncestors reports we are approaching the 100 year anniversary of Women's Suffrage in California. Descendants of California Suffragists are being sought for participation in the festivities. Watch the full episode. See more Metrofocus. While not directly related, those interested in blogging, and those interested in writing family histories do need to consider copyright concerns. The "Fair Use Doctrine" in US copyright law can be confusing. - Neil Netanel of the UCLA School of Law recently published a paper concluding that court application of Fair Use has changed significantly over the past couple decades. 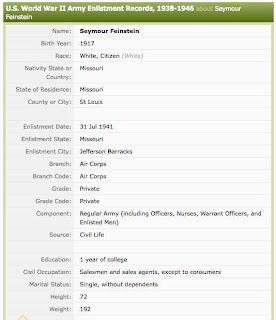 This week, I look at the obituary for my second great grandfather, Selig Feinstein. The obituary appeared in the March 12th, 1915 edition of The St. Louis Jewish Voice.